As I took my seat on Friday for the opening night of Das Rheingold, I couldn’t help but feel apprehensive. I’d previously discussed the HGO’s new Ring Cycle with managing director Perryn Leech and artistic director Patrick Summers (who would be on the podium tonight) and both praised the production by Spanish theater company La Fura dels Baus, known as the Valencia Ring, which had debuted to rave reviews in Europe and was making its American debut in Houston. Although Fura dels Baus was founded in 1979 and has produced major events around the world, most famously the opening ceremony of the 1992 Barcelona Olympics, it remains relatively unknown in the United States. For the HGO’s first-ever production of Richard Wagner’s four-part, 15-hour music drama, which it’s rolling out over the next three years, Leech and Summers could have been excused for playing it safe by going with a more traditional production by a better-established company. Instead, they chose an experimental production that, at least superficially, bears little relationship to Wagner’s stage directions. 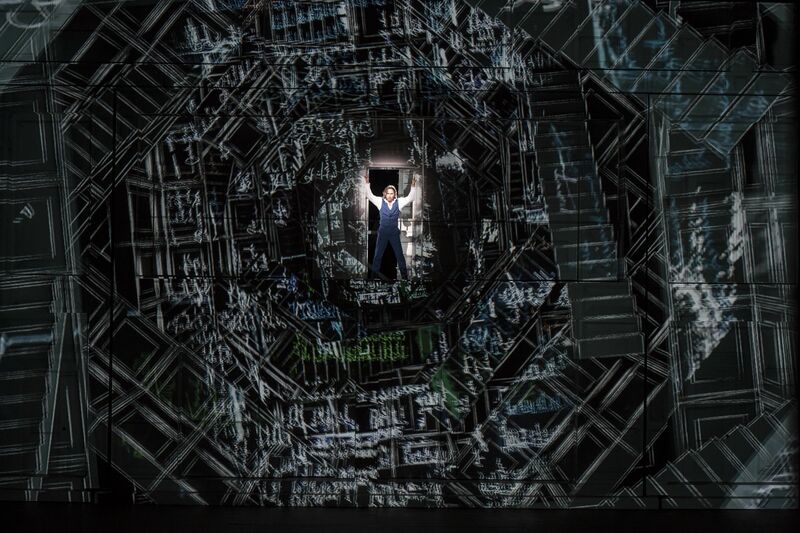 Compounding my apprehension about the HGO’s choice was my memory of watching Robert Lepage’s controversial Ring Cycle at New York’s Metropolitan Opera between 2010 and 2012. Lepage, who made his name at Cirque du Soleil, had gambled his entire production on a single, 45-ton piece of machinery comprising 24 planks that could be rotated around a central axis to resemble anything from a hut to a mountaintop. Unfortunately, the machine was temperamental—even when it was working (and sometimes it didn’t), it creaked and groaned during every change in configuration, distracting attention from the singers and drawing down abuse from the New York critics. Lepage was booed after many performances. 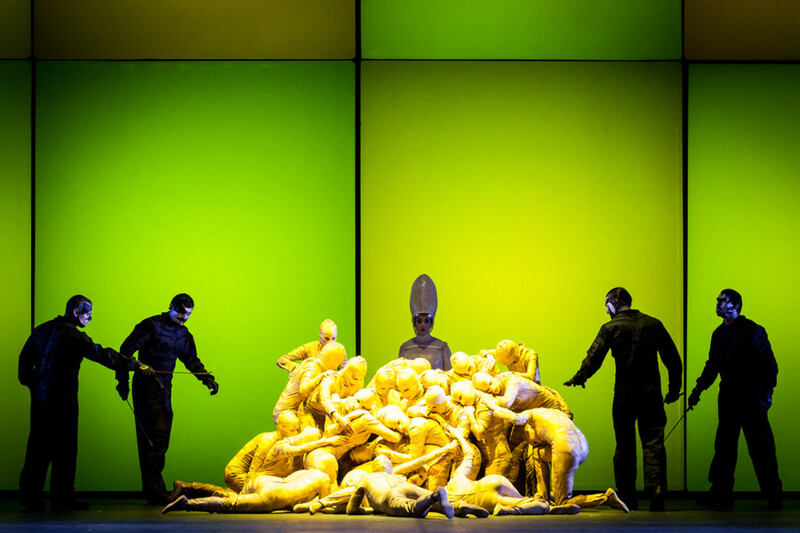 So when I saw production photos of the Fura dels Baus production of Das Rheingold—gods on cranes, a Valhalla made of interlinked acrobats, Rheinmaidens in fish tanks—I braced for another overreaching experimental production hamstrung by malfunctioning technology. Two and a half hours later, after picking my jaw off the floor, I knew I’d just seen a masterpiece. As opposed to the Lepage ring, which couldn’t seem to decide whether it was avant-garde or traditional—its costumes hewed closely to Wagner’s original sketches, for instance—Fura dels Baus presents a unified aesthetic and philosophical interpretation of a work that begs, like all great art, to be interpreted. Whether or not you sympathize with that interpretation—the production imagines the Rheinmaidens’ gold as human embryos that Alberich exploits as a form of Marxist/Foucauldian biopower—there’s no denying its internal coherence or imaginative force. This is a production to be reckoned with. For all my concerns about the production, it was the HGO orchestra, normally so assured, that started Rheingold off on a false note—literally. Only a few minutes into the prelude, which opens so quietly that any mistake is immediately audible, a trumpet misfired during one of its ascending lines evoking the dawning of day. It wasn’t just the poor trumpeter, though; the entire orchestra seemed unsettled, nervous. Fortunately, under Maestro Summers’s expert baton, they soon pulled themselves together, and the remainder of the opera went off virtually without a hitch. Perhaps the orchestra took cheer from the singing, which, with one or two exceptions, was about as good as I’ve ever heard. Despite having to sing from water-filled acrylic cubes suspended above the stage, the Rheinmaidens sounded heavenly. As Alberich, English baritone Christopher Purves brought out his character’s full pathos and menace, growing increasingly despotic after stealing the gold and enslaving his fellow Niebelungen, only to end up seething in impotent rage after being tricked out of his ring. 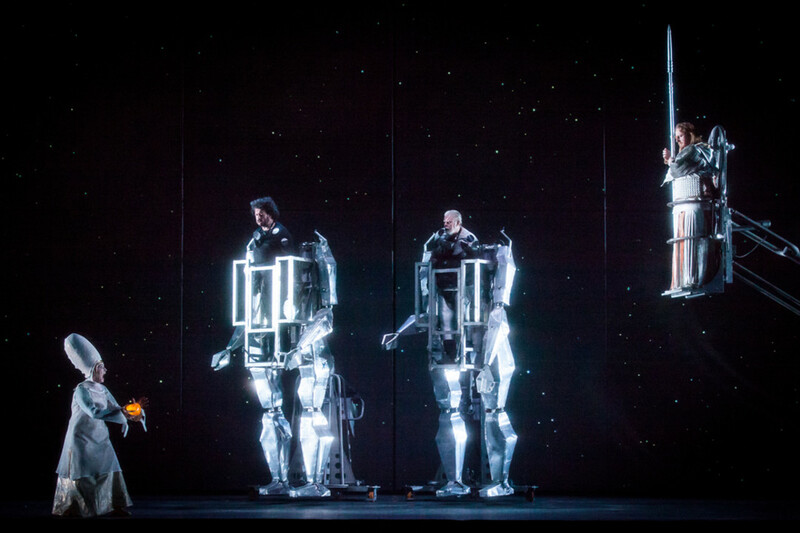 Purves’s vocal power was matched by English bass-baritone Iain Paterson as Wotan, American mezzo-soprano Jamie Barton as Fricka, and, in a show-stealing performance, the Czech tenor Stefan Margita’s joyful rendition of the mischievous Loge, who in this production rides around on a Segway, wears a Buck Rogers–style costume, and sports a long red goatee. All the skepticism raised by the production photos I had seen melted away in the face of the actual performance. 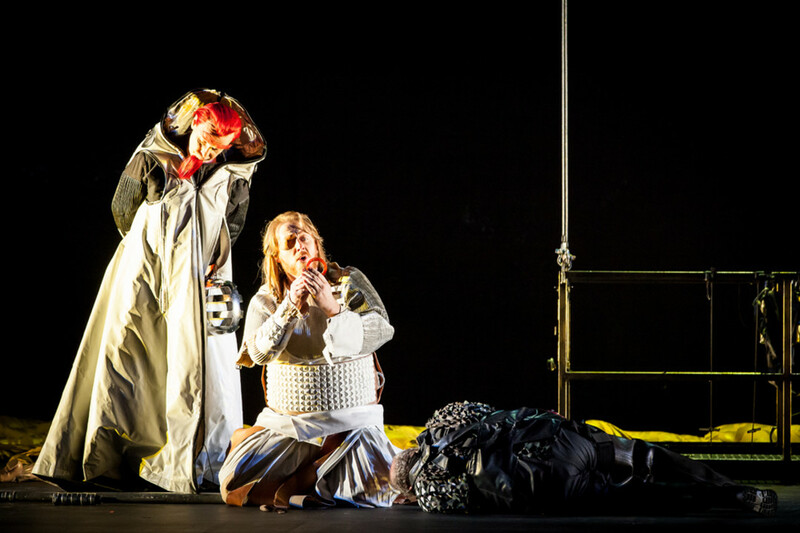 After beginning the opera with Alberich’s theft of the gold from the Rheinmaidens, the opera whisks us to the top of a mountain, which this production interprets as a extra-planetary vantage point, perhaps the moon, with the gods floating around as if weightless. This effect is achieved by mounting each singer on a separate crane operated by two supernumeraries each, who wheel the singers back and forth across the stage, raising them and lowering them as need be. The crane operators are so skillful that the scene never feels static and the singers never seem confined, although they almost never leave the cranes to walk around. Enhancing the effect, here and throughout the opera, are the dazzling video projections created by Fura dels Baus's Fran Aleu, including some how-did-they-do-that three-dimensional projections that seem to float beside the singers, or even encircle them with a heavenly aureole of light, as with Wotan. In keeping with his role as a demi-god of fire, Loge first appears surrounded by shimmering, video-projected flames. 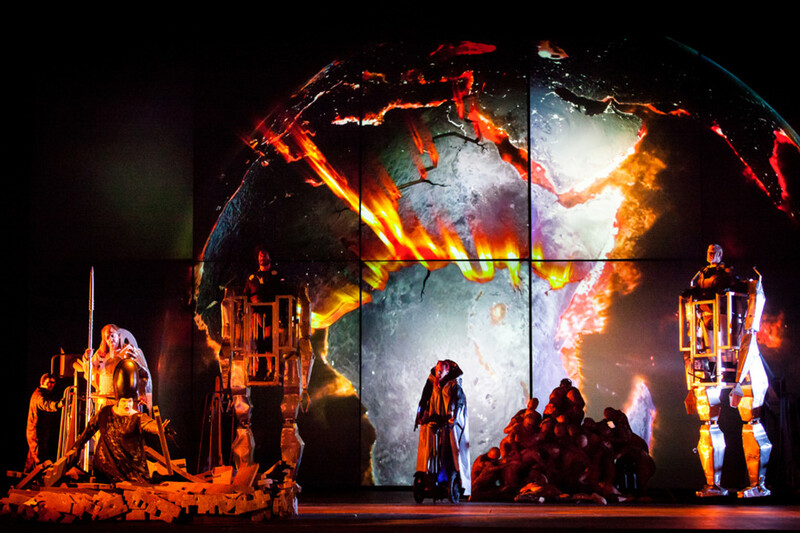 The production's dramatic highlight is the descent of Wotan and Loge to Niebelheim, which is portrayed using swooping, IMAX-style visuals that make the audience feel like it’s actually traveling into the earth. Niebelheim itself is rendered as a subterranean hell pit where Alberich’s golden embryos are hatched into humans, which are then suspended upside down on meathooks and sent down an assembly line. With its evocations of the Holocaust and of industrial slaughterhouses, the production succeeds in making Alberich’s plot seem genuinely terrifying. 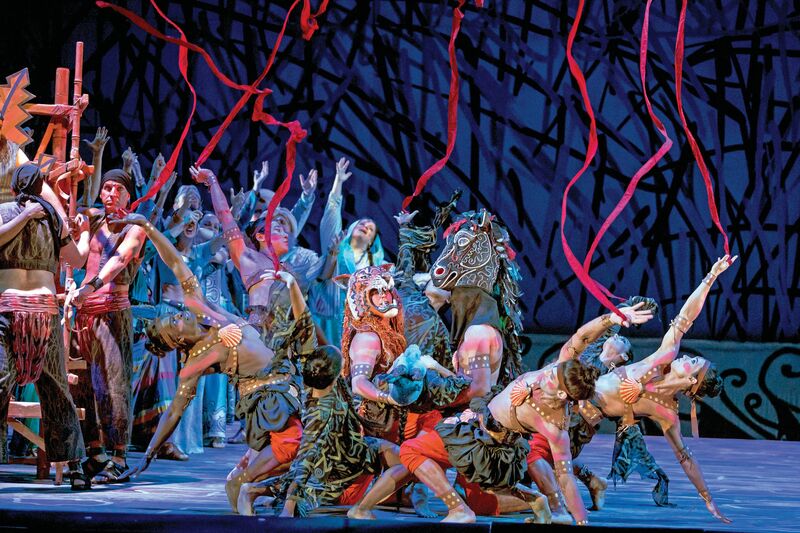 One of the few stumbles in an otherwise spectacular production is the entrance of Erda, the earth goddess who foretells the future (American contralto Meredith Arwady), towards the end of the opera. Her entrance from underground should be a relatively simple stage trick, but for some reason Fura dels Baus simply has a pile of rubber pieces painted to look like rubble pushed onto the stage. Erda rises from the rubble, sings, then lies down and buries herself in rubber pieces again. This is a production with fire-breathing dragons and anime-style Mech giants, but it can’t manage a decent trap-door entrance? That hiccup aside, this is a production that, to quote Oscar Wilde, continually astonishes. Purists who criticize the production’s creative liberties should remember that Wagner himself was an artistic revolutionary and experimentalist, introducing countless innovations in operatic production and pushing the limits of 19th century technology. If Wagner were alive today, he’d likely still be pushing the limits; in that sense, the Fura dels Baus production is actually truer to the original spirit of the Ring Cycle than many so-called “traditional” stagings. 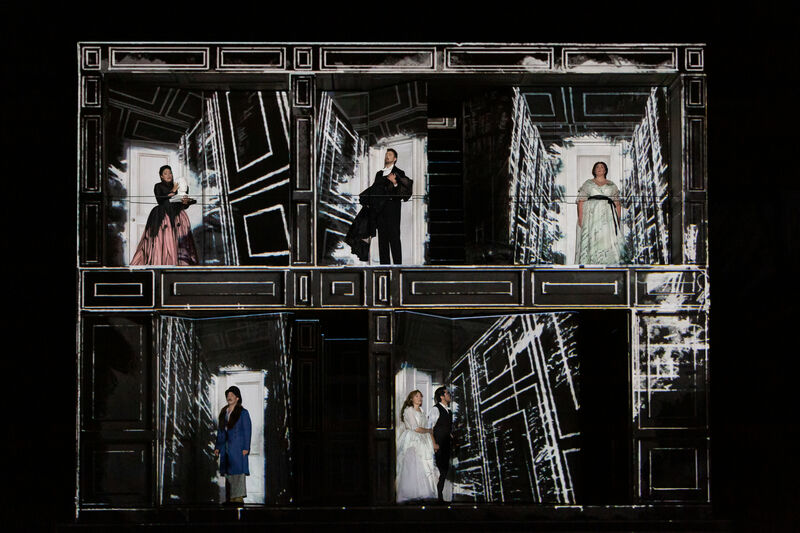 If the next three operas in the series are anywhere near this good, Houston is in for a very exciting few years.